With an ongoing commitment to Healthy Eating – Better Living™, Freshens Fresh Food Studio is introducing “100% clean” smoothies this spring. 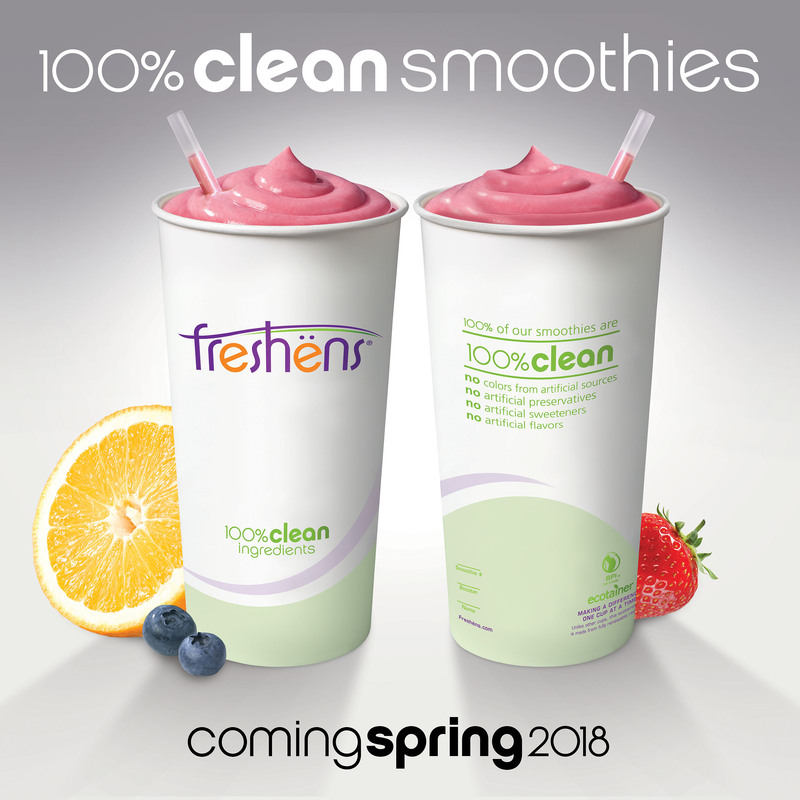 Atlanta, GA – To meet the growing demand for healthy options in the “better-for-you” foodservice category, Atlanta-based Freshëns Fresh Food Studio will be the first restaurant concept in the industry to blend 100% of its smoothies with 100% clean ingredients. That means no artificial preservatives, sweeteners, flavors and no colors from artificial sources. The new smoothie recipes will be introduced in the spring of 2018 with product samplings and tasting events held at various locations across the country. The refined and enhanced recipes are also gluten friendly, free from growth hormones and contain only non-GMO fruits and vegetables as well as vegan raw sugar. Plant based protein options will be available, and the newly-designed renewable packaging is 100% compostable and manufactured from sustainable forests, making it a more environmentally friendly option. The launch of the 100% clean smoothie menu comes on the heels of Freshens’ successful menu expansions that include the addition of globally-inspired rice bowls, fresh tossed salads and grilled flatbreads. The continually-evolving healthy menu has made the Freshens brand an increasingly-popular choice for guests and for foodservice operators. “By continually improving our menu and providing best of class support for our brand, our goal is to make Freshens the number one choice as a healthy dining option for guests and foodservice operators in colleges, airports, hospitals, malls, sports arenas, military bases and other captured audience locations,” said Ed Redmond, Senior Vice President. Freshens offers foodservice directors flexible store layouts with a great depth of product in a compact space as well as full national brand support for marketing and operations. Freshens licensed programs feature low cost of entry, no royalty or advertising fees and full national brand support and training. The new menu options are an important part of the company’s expansion strategy, as it opens up additional opportunities for food service operators in locations where healthy meal choices are desired. Freshens plans to open 40 new locations in 2018, with a primary focus on colleges, airports, hospitals and military bases. Freshens specializes in healthy “fast casual” food that is flavorful, bold and craveable. Founded in 1985, Freshens has over 450 locations worldwide with 63 partners in the U.S. Freshens is a privately held corporation headquartered in Atlanta and is focused on innovative, healthful products for consumers looking for convenient, portable and great tasting options. By adapting to ever-changing customer needs and industry trends, Freshens is poised for continued growth. For more information, go to www.Freshens.com.